Instituto de Macromoléculas Professora Eloísa Mano (IMA), Universidade Federal do Rio de Janeiro (UFRJ), Rio de Janeiro, Brasil. Hydroxyapatite (HA) was synthesized in situ by the precipitation method, with and without the presence of collagen (COLL), to study its influence on HA’s structural and morphological characteristics. The material was characterized by energy dispersive X-ray spectroscopy (EDX), Fourier transform infrared spectroscopy (FT-IR), wide-angle X-ray diffraction (WAXD), thermogravimetric analysis (TG) and scanning electron microscopy (SEM). The Ca/P molar ratio was influenced by collagen addition—1.89 and 2.38 for samples without and with collagen, respectively. The WAXD pattern revealed better resolution and intensity besides higher crystallinity degree of the HA in the presence of collagen. The photomicrographs showed a strong influence of collagen on the HA morphology. 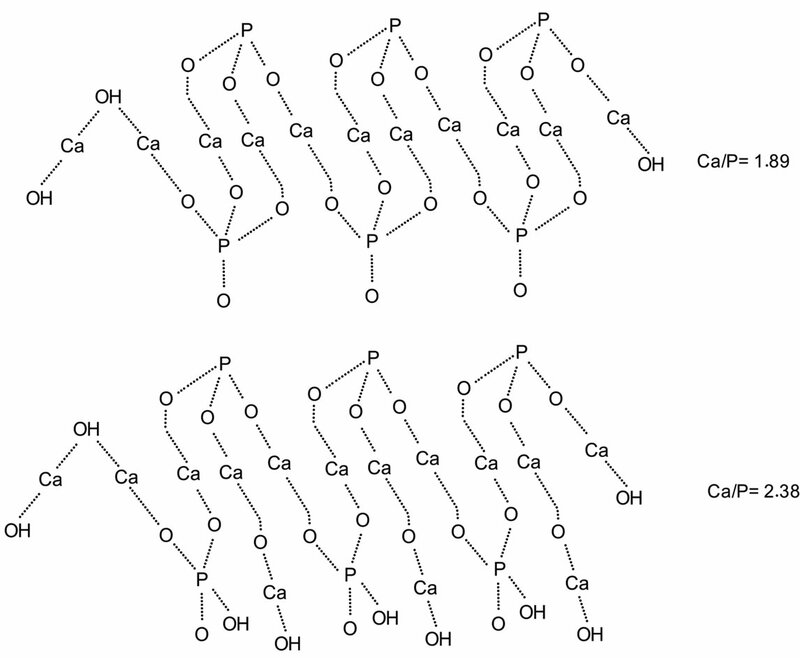 Calcium phosphate apatites make up an important class of biomaterial, with hydroxyapatite (HA), Ca10(PO4)6(OH)2, being the most important due to its similarities with the mineral constituents of bone tissue and tooth enamel and dentin [1-3]. HA has excellent biocompatibility, displaying properties of osteoinduction, osteoconduction and osteointegration without cellular toxicity [4,5]. Therefore, HA is one of the most biocompatible materials known. As such, it has been studied for potential applications in areas such as tissue engineering, orthopedics and dentistry . Collagen (COLL) is a natural and fibrous polymer constituting about 30% of all vertebrates’ body proteins. There are more than 26 genetically distinct collagen types described, of which type I—commonly found in connective tissues, including tendons, bones and skin is one of the most studied . It is characterized by an amino acid sequence—glycine (Gly), proline (Pro), Y, Gly, X and hydroxyproline (Hyp), where Y and X are any amino acid—arranged in a triple-helical conformation. The repeated unit could be represented by the following sequence: (Gly-Pro-Y-Gly-X-Hyp)n. This structure is stabilized by inter and intramolecular hydrogen bonds among the amide groups of the backbone chain amino acids [8-10]. Collagen has biomedical, cosmetic and pharmaceutical applications, among others [11,12]. Gelatin—denatured collagen—is a heterogeneous mixture of water-soluble proteins with high molecular weight. Denaturation requires acid or alkaline pretreatment. Additional heat breaks the hydrogen and covalent bonds, leading to triple-helix rupture [13-16]. Recently, composites based on collagen/hydroxyapatite have been studied for bone and dental repairs [17,18]. Sol-gel, precipitation, biomimetic and hydrothermal processes are synthesis routes to produce collagen/hydroxyapatite composites [19,20]. Among them, precipitation is one of the most often used because it can produce a large amount of hydroxyapatite without organic solvent. 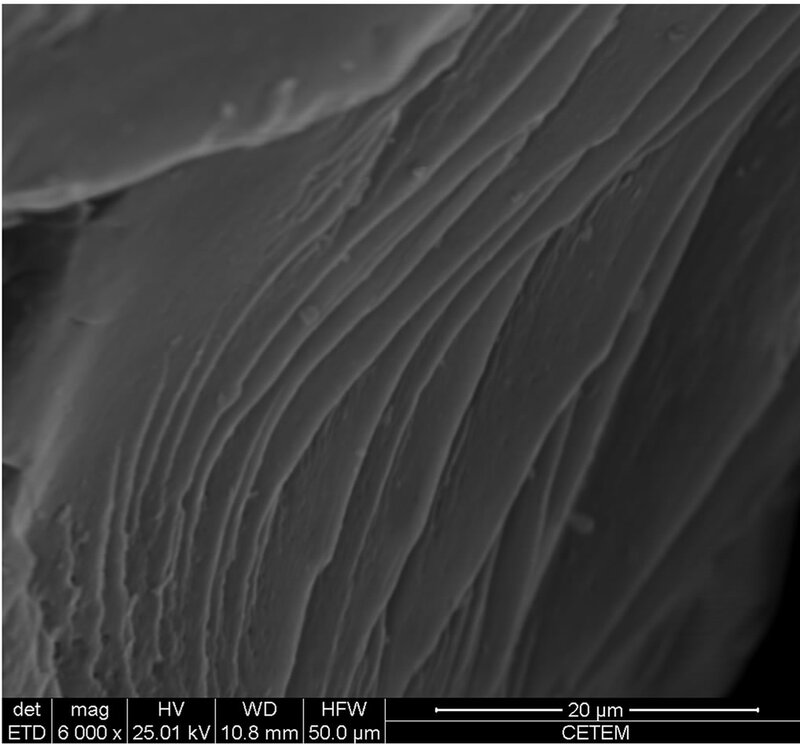 A material with morphology similar to compact bone was found by Ficai and colleagues  based on COLL/ HA composite produced though the precipitation method. A biomimetic process was used by Wang and colleagues  to produce composite by deposition of HA onto a collagen substrate. The Ca:P molar ratio was 1.58, very close to that of bone tissue. Using a similar process but different precursors, Ficai and colleagues  produced a collagen polymeric substrate containing HA crystals on its surface. The purpose of this work was to study the influence of collagen on the structural and morphological characteristics HA crystals synthesized in situ. The collagen type I was purchased from Proquimios (Rio de Janeiro, Brazil). The inorganic materials—calcium nitrate tetrahydrate Ca(NO3)2·4H2O, ammonium phosphate (NH4)2HPO4 and ammonium hydroxide (NH4OH) —were used for HA synthesis and were purchased from Vetec Química Fina Ltda. (Rio de Janeiro). Hydroxyapatite in the presence of collagen was prepared as follows. Two aqueous solutions were prepared: Solution A—62.5 mL of calcium nitrate tetrahydrate Ca (NO3)2∙4H2O (2.42 M), containing collagen (3.96 grams), and Solution B—62.5 of mL ammonium phosphate (NH4)2HPO4 (1.48 M). The pH of both was adjusted in the range 10 - 11 using ammonium hydroxide (NH4OH) (8 M). The B solution was dripped onto the A solution, under mechanical stirring (350 rpm), flow rate of 100 mL/h and temperature of 80˚C for approximately 40 min. After this period, the reaction medium was kept under mechanical stirring for 2 hours. In order to compare the results, hydroxyapatite without collagen was synthesized using the same method. To avoiding removing the collagen—water soluble material—the samples were freeze dried instead of being washed in water . FT-IR spectra of the samples were obtained using a Varian model 3100 Excalibur Series spectrometer, with resolution of 2 cm−1 and 40 scans, in the range of 4000 - 400 cm−1, from a KBr disk, to evaluate the interactions between the COLL and HA. The thermal stability of the samples was estimated by thermogravimetry/differential thermogravimetry curves, registered in a TA Instruments model Q500 analyzer, from 30˚C to 700˚C at 10˚/min, under nitrogen atmosphere. The initial, final and maximum degradation temperatures were measured. 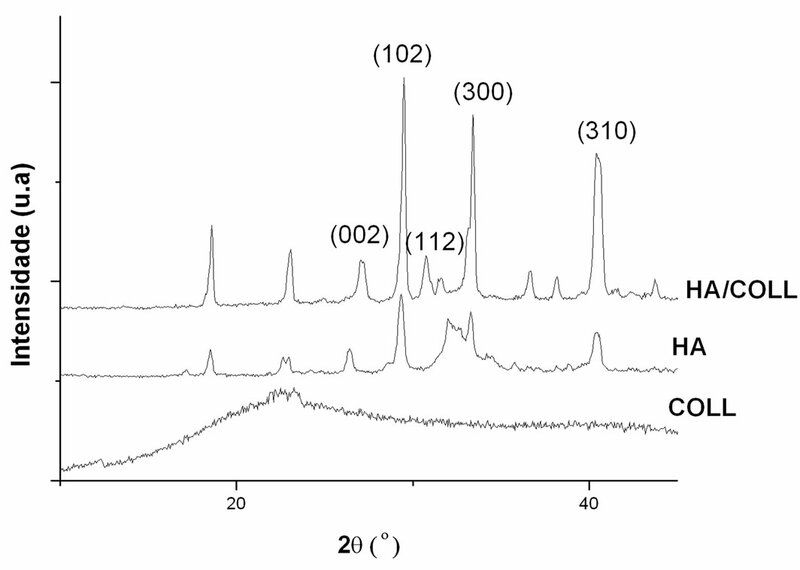 The Ca/P ratio of the HA, with and without collagen, was determined X-ray energy-dispersive spectroscopy using a Shimadzu model 720 spectroscope. Wide-angle X-ray diffraction was performed in a Rigaku Miniflex diffractometer using Cu Kα radiation at 30 mA, 40 kV and 2θ scans from 2˚ to 60˚, to assess the crystalline structure and changes in the 2θ reflection angles of the HA. The crystallinity degree (Xc) of both HA types was calculated using the values given by the Fityk program, through the ratio of crystallinity and total area of the diffractogram peaks. The average size of the HA crystallites was obtained using the full width at half maximum (FWHM) of each diffractogram, using Scherrer’s equation equation (1) [25,26] where K is the Scherrer constant, (FWHM) = 1, β is a measure of the line broadening, λ is the wavelength of the X-ray = 1.5418 Ǻ, and θ is the angular position of the reflection peak. Bragg’s law equation (2) was used to determine the spacing of the crystallographic planes, where n is an integer, λ is the incident wavelength, d is the spacing between planes in the atomic structure, and θ is the angle between the incident ray and the scattering planes [27,28]. The morphological features of the materials were investigated with a GO model JSN5610LV scanning electron microscope. The powder was coated with a gold layer and the images were taken using 3.000 and 6.000 magnifications. Figures 1 and 2 show the FT-IR spectra of the collagen and both HA types, respectively. 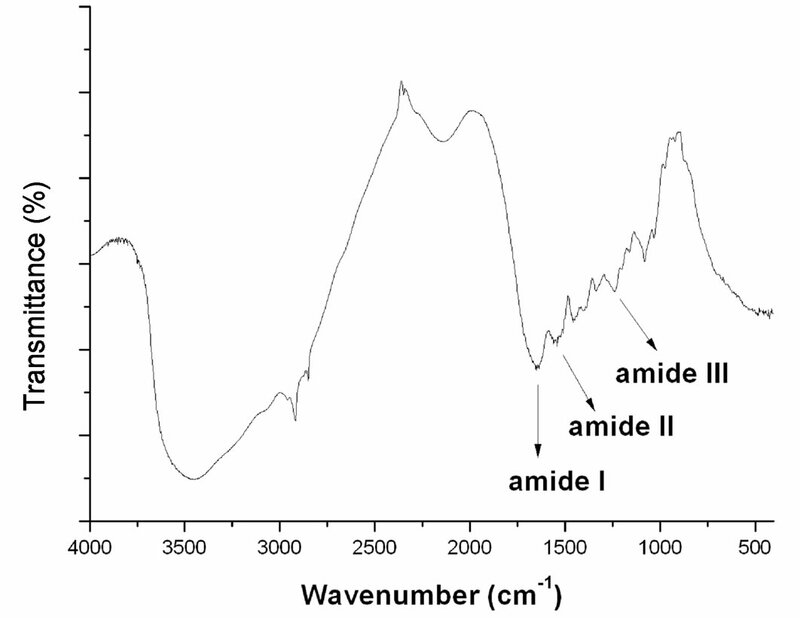 The collagen’s characteristic absorptions were 1644 cm−1 (amide I, C=O), 1538 cm−1 (amide II, N-H stretching and C-N deformation), 1456 cm−1 (C-N deformation), 1234 cm−1 (amide III, C-N deformation and N-H stretching), 2842 cm−1 (CH2 asymmetric stretching), 2919 cm−1 (CH2 symmetric stretching) and 2849 cm−1 (CH3 symmetric stretching). The band shown at 3071 - 3470 cm−1 corresponds to associated-OH . A high resolution HA spectrum without collagen was achieved. The 470, 562, 601, 962, 1035 and P-O 1106 cm−1 absorptions were attributed to the bending and symmetric stretching vibrations. Figure 1. FT-IR spectra of the collagen. Figure 2. 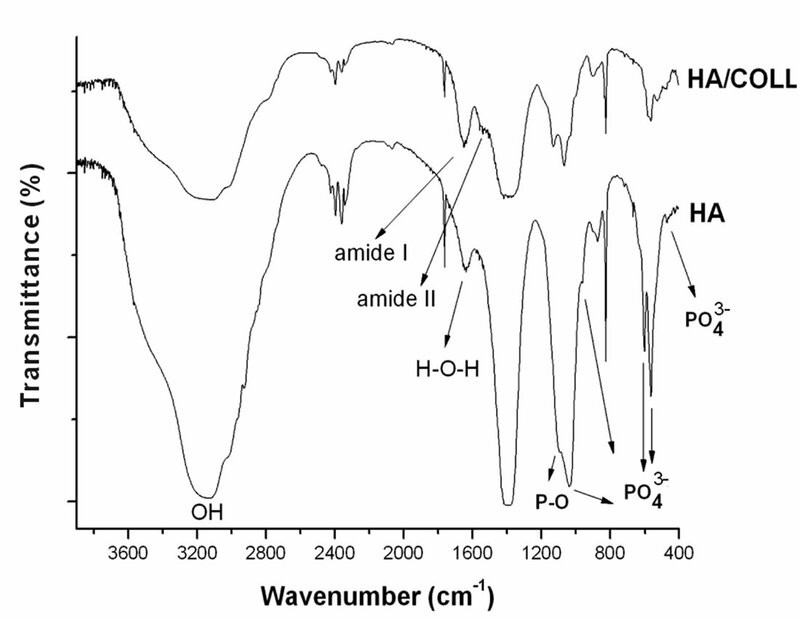 FT-IR spectra of the hydroxyapatite with and without collagen. The -OH stretching absorption is composed of a shoulder (3575 cm−1) and a peak at 3493 cm−1, associated and free, respectively. The -OH bending vibration appeared as a weak peak at low frequency (669 cm−1) . The absorption at 1644 cm−1 could be ascribed to two types of vibrations—in plane H-O-H bending (water) and carbonyl stretching (carbon dioxide). Concerning the HA with collagen, the main HA absorptions could be detected but some peaks were merged with the collagen indicating some chemical interactions. The TG/DTG curves are shown in Figures 3 and 4. 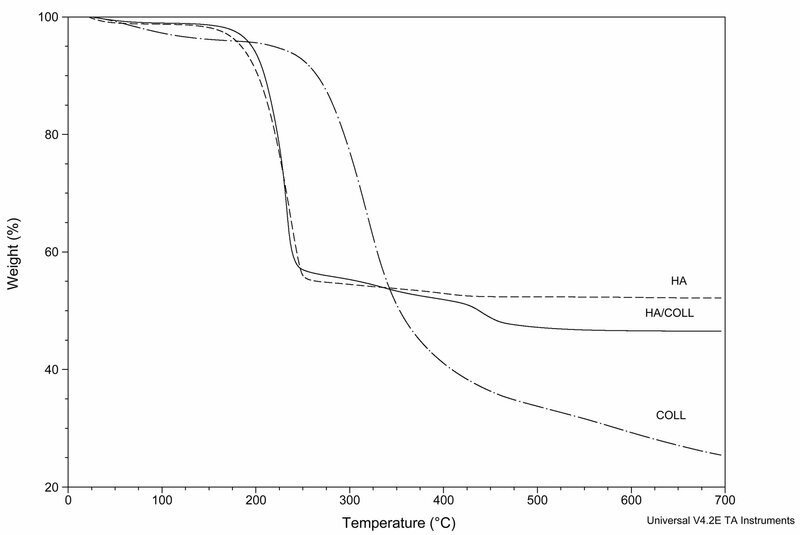 Table 1 contains the degradation onset temperature (Tonset), maximum temperature (Tmax) and final temperature (Tend), as well as the residue content. The collagen thermal curve showed two stages of degradation. The first (25˚C - 200˚C, 8%) could be attributed to the loss of water and the second (270˚C - 500˚C, 65%) to polymer chain degradation. The HA’s thermal curve without collagen showed only one stage of degradation (150˚C - 235˚C), associated with the loss of water along with residue. 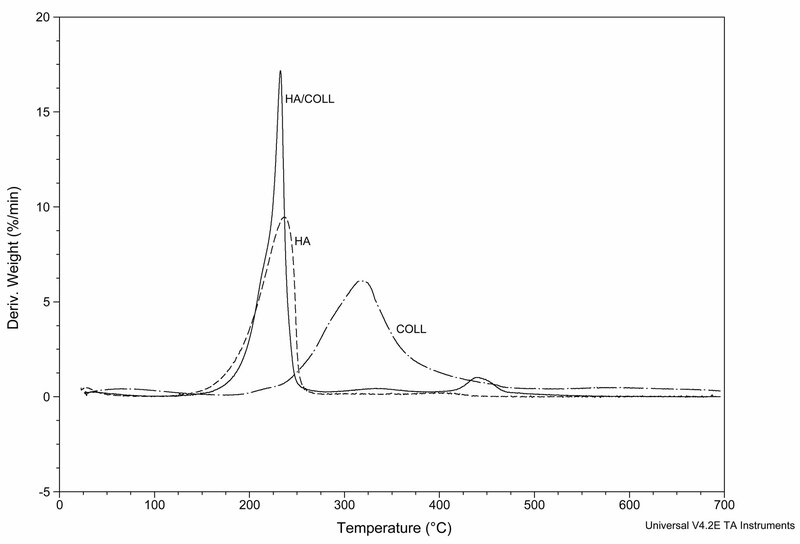 In contrast, the thermal curve of the HA synthesized with collagen showed two stages of degradation. The initial stage was similar to that of HA without collagen, while the second one appeared at higher temperature (425˚C - 450˚C). This could indicate some chemical and/or physical interactions between components, leading to an increase of the collagen’s thermal stability . Ca/P ratios of 1.89 and 2.38 were calculated for HA without and with collagen, respectively. The first value is near the theoretical value (1.67) considering the repeat unit of the HA chemical structure—Ca10(PO4)6(OH)2 . The addition of collagen influenced the HA chain growth. The chain catenation and the repeat unit were modified. Figure 5 shows the schematic representation of the feasible repeat unit of the HA, with and without collagen. Table 1. TG/DTG parameters of the COLL, HA and HA/COLL. Figure 3. TG curves of collagen, HA and HA/COLL. Figure 4. 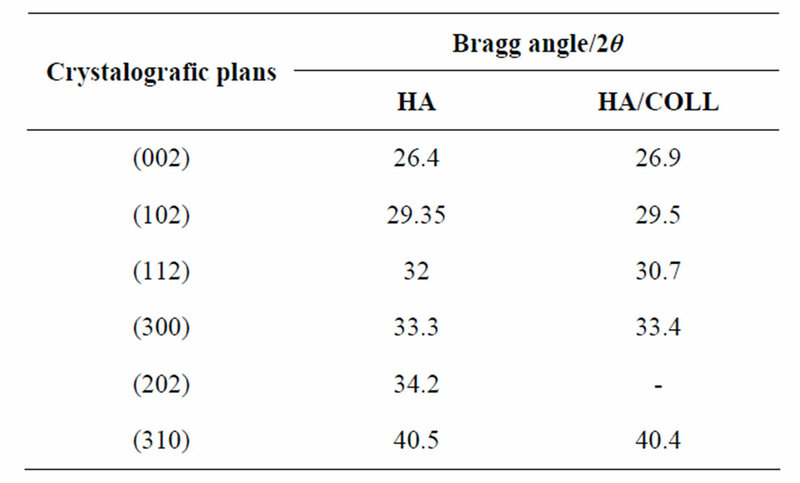 DTG curves of collagen, HA and HA/COLL. preferentially toward the crystallographic plane related to the 2θ diffraction angle, equal to 33, as reported by Ficai and colleagues . The crystallinity degrees (Xc) were 58% and 75%, for the HA without and with collagen, respectively. The increase denotes that the collagen seems to play a role as nucleating agent of the HA. The interplanar distance value (0.48 Å) was the same for both HA types [28,29]. 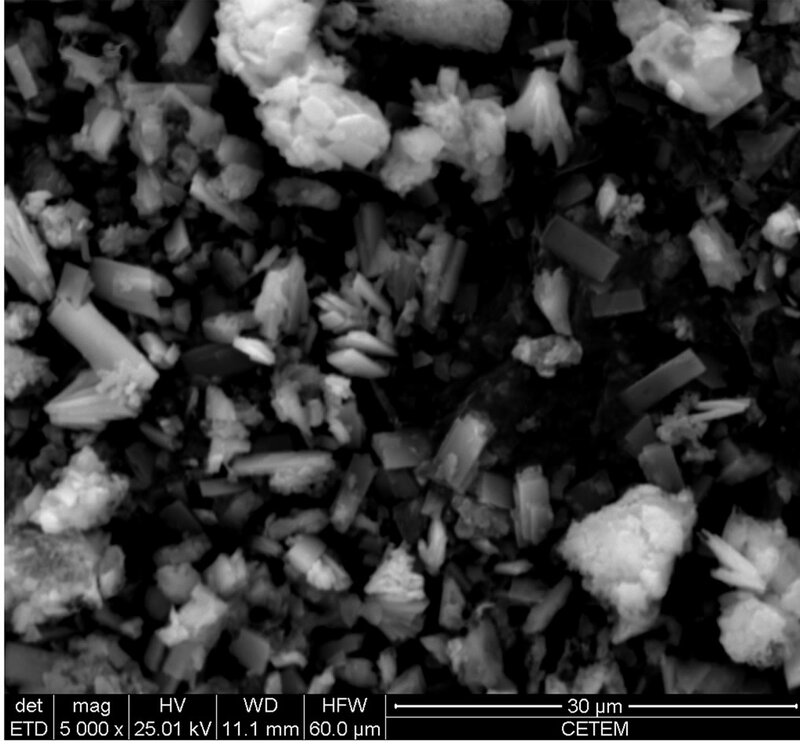 The SEM photomicrographs of the materials are shown in Figure 7. The images revealed morphological differences between the two hydroxyapatites. The HA synthesized in the presence of collagen showed morphology similar to regular microrods. In the absence of collagen, irregular cluster morphology was achieved. Figure 5. Schematic representation of the feasible repeat unit of the HA: Ca/P = 1.89 and 2.38, without and with collagen, respectively. Figure 6. WAXD of the HA, COLL and HA/COLL materials. Table 2. Bragg angle and crystallographic planes of the HA and HA/COLL. Figure 7. SEM photomicrographs of the HA (a); COLL (b); HA/COLL (c). that chemical and/or physical interaction between the HA and collagen could have existed. Structural differences with respect to the HA repeat unit was indicated by EDX. The WAXD revealed that the crystallinity degree was higher in the HA produced in the presence of collagen. SEM images showed strong action of the collagen on the HA’s morphology. The authors thanks the National Council for Scientific and Technological Development (CNPq), National Council for the Improvement of Higher Education (CAPES) and Federal University of Rio de Janeiro (UFRJ). 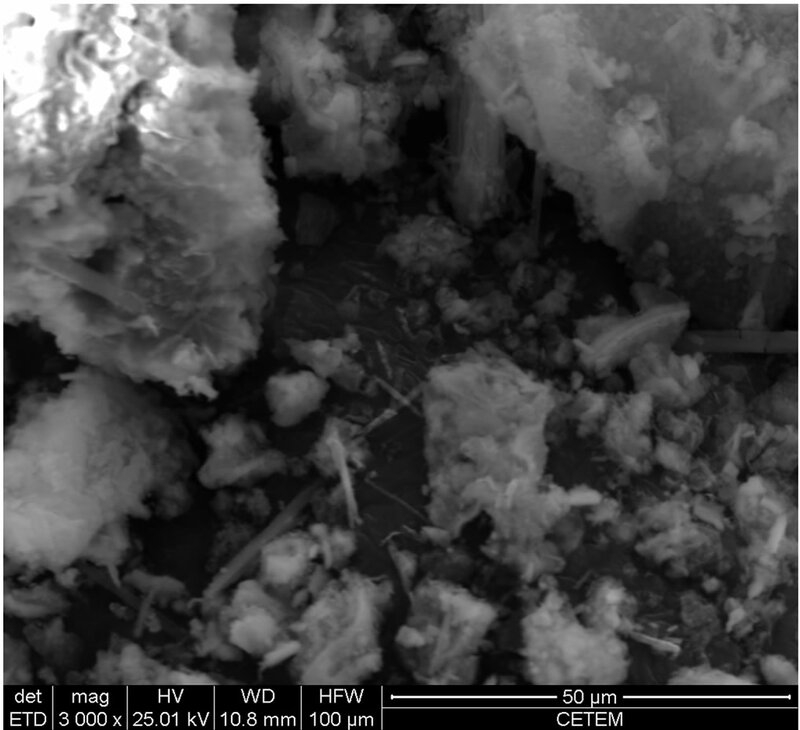 G. Zuo, C. Liu, H. Luo, F. He, H. Liang, J. Wang and Y. Wan, “Synthesis of Intercalated Lamellar Hydroxyapatite/ Gelatin Nanocomposite for Bone Substitute Application,” Journal of Applied Polymer Science, Vol. 113, No. 5, 2009, pp. 3089-3094. K.-L. Ou, R.-J. Chung, F.-Y. Tsai, P.-Y. Liang, S.-W. Huang and S.-Y. Chang, “Effect of Collagen on the Mechanical Properties of Hydroxyapatite Coatings,” Journal of the Mechanical Behavior of Biomedical Materials, Vol. 4, No. 4, 2011, pp. 618-624. A. A. Haroum, H. H. Beherei and M. A. Abd El-Ghaffar, “Preparation, Characterization, and in Vitro Application of Composite Films Based on Gelatin and Collagen from Natural Resources,” Journal of Applied Polymer Science, Vol. 116, No. 4, 2010, pp. 2083-2094. L. Zhang, P. Tang, M. Xu, W. Zhang, W. Chai and Y. Wang, “Effects of Crystalline Phase On The Biological Properties of Collagen-Hydroxyapatite Composites,” Acta Biomaterialia, Vol. 6, No. 6, 2010, pp. 2189-2199.